You probably have listened or read the news about prehistoric animals that lived thousands of years ago or about the mummies that were dug up from its tomb which died about 5000 years ago. And wonder how do paleontologist and archaeologist came up with this number? Do they just guess this number? 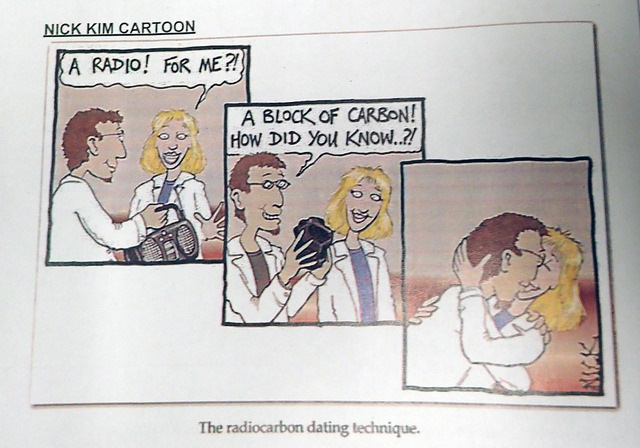 Well of course not it’s called Radiocarbon dating and we have been doing this for a very long time since, the 1940s. By the end of this article, I will make sure you know A to Z about Carbon dating and will also show you a way to find the age of the moon. In order to understand Carbon dating, we will look into an atom of Carbon and its isotopes. An atom consists of numbers of neutron, proton, and electron. 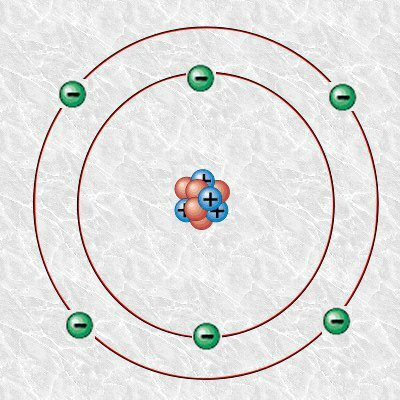 Take a look at the Bohr model diagram of the carbon atom. The number of proton in the atom determines the name of the atom, for example, an atom with six protons (which is color blue in our atom model) is a carbon atom. The carbon atom also has six neutrons which make its mass number 12 i.e. you add proton and neutron for the mass number. Of all the three carbon atoms C12 is the most abundant one in nature. It is because as the number of neutrons becomes larger than proton the element becomes unstable. Because of this, the unstable carbon atom decays away into another element. And by decay I mean it changes into the atom of other elements. 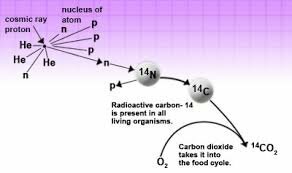 The Carbon 14 is the most unstable which radioactively decays and changes to Nitrogen 14(seven proton plus seven neutrons). Now I will introduce you to a term Half-life. The half-life of Carbon 14 is 5730 years but what does this mean? Suppose you have 100 carbon atoms in a box. As I said before Carbon 14 being unstable changes to a more stable nitrogen atom in a process called radioactive decay. Now in 5730 years of the 100 Carbon 14 atom that you have 50 of them decays away and you are left with 50 Carbon 14 atoms. In the next 5730 years, half of the 50 Carbon atoms that you have now decays away and you are left with 25 atoms. This process goes on for the next period years but surprisingly the number of carbon atoms never reaches zero it is always some number. The amount Carbon 14 created in our environment is almost constant. This Carbon 14 combines with atmospheric oxygen creating Carbon dioxide which is absorbed by plants to make fruits and the plant itself. This is then eaten by animals and taking in the Carbon 14 as well. This makes sure that the ratio of the Carbon 12 to Carbon 14 atom in a living being is always constant. Why? You ask? It is because the Carbon 14 atom which is decaying gets continually replaced by new Carbon 14 atom as the living organism breathe and eat in the environment. At the current time, you have the same ratio of Carbon 14 atom as that of other living animals and plants living currently. Finally, we are at the main point of this article, after the death of the living organism, it stops taking in new Carbon 14 atoms. With time the number of carbon 14 atom decreases as it decays into Nitrogen 14 atoms. Meanwhile, the Carbon 12 remains constant. Now by looking and comparing the ratio of the Carbon 14 atoms of the specimen (fossil may be) to that of the living organism we can determine the age of the specimen. 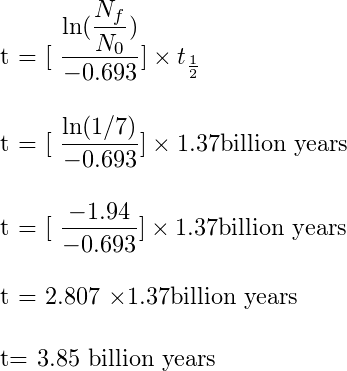 This equation is not that complex, “ln” is the natural logarithm, “Nf/No” is the ratio of Carbon 14 in the fossil specimen to that of the living specimen and “t1/2” is the half-life of Carbon 14. Suppose you have a sample that has 60% carbon 14 when compared to a living sample if you plug in this number and the half-life of Carbon 14 i.e. 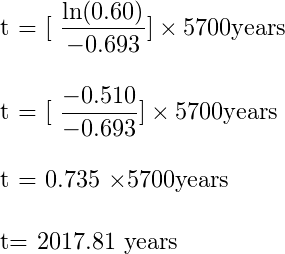 5,700 years in the above equation then you will get 2017.81 years. This means that the sample is 2017 years old. 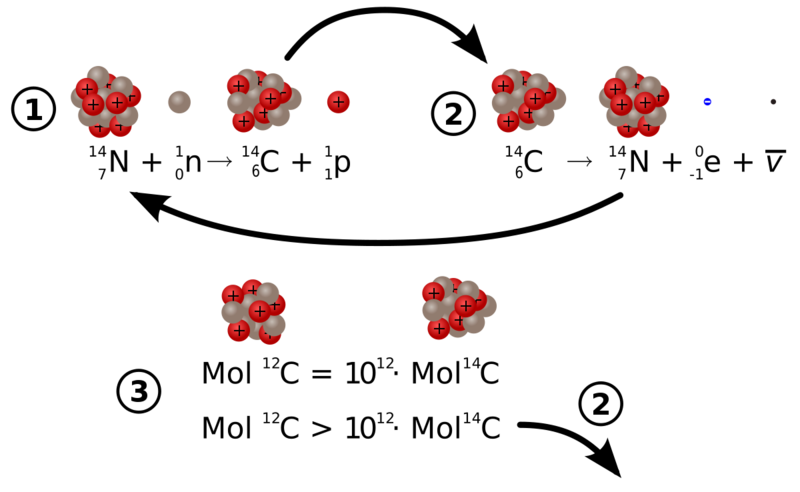 The measurement of the Carbon 14 atom is done by a method known as “beta counting” which is detecting the beta particles emitted by decaying Carbon 14 atoms. This is done by a Geiger counter which is an instrument used for detecting and measuring ionizing radiation. 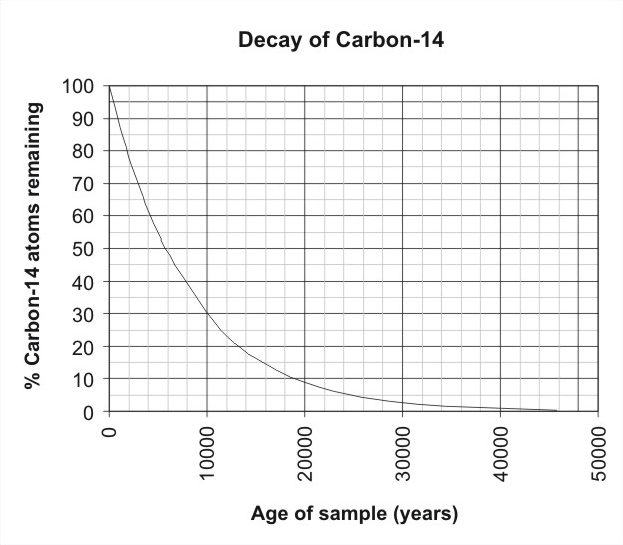 For samples that are older than 60,000 years, the percentage of Carbon 14 is so low that measuring the percentage is very difficult. So, it is difficult to get reliable age of specimen which is older than 60,000 years. This problem can be solved by using isotopes of other elements with linger half-life. For example, Potassium 40 is another isotope of potassium which is found in the living beings and has the half-life of 1.3billion years. This allows us to date a fossil of an animal which died many millions of years ago. Like I said at the beginning of the article, we now find the age of the moon using Radio dating. The principal of carbon dating can be applied to isotopes of other elements.The astronaut from Apollo 11 mission brought back rock samples from the moon. 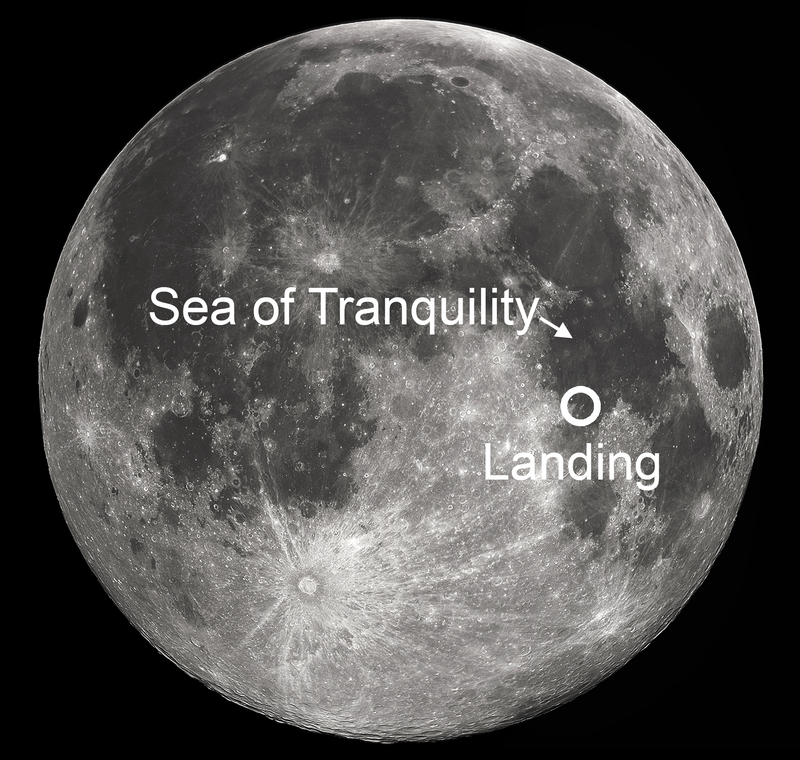 This moon rock from Sea of Tranquillity has isotope of potassium 19K40 which has the half-life of 1.37 billion years and decays to Argon 40. After analyzing the sample here on earth it was found that the ratio of Potassium atom to argon atoms is roughly 1/7. Now from this information if we plug in the numbers in the above equation, we will find the age of the moon. The number I got is 3.85 billion years. More accurate results that were obtained from the sophisticated laboratory taking into account for other variables showed the age of the moon to be 4.43 ± 0.13 x 109 years. My result is almost near to the result from these labs, it is because I haven’t taken into account of the calibration curve and other more sophisticated parameters used by these labs. Now that you’ve been through the post, you have a general idea of applications of Carbon dating and not the one depicted in above picture. If you have any feedback regarding the post, please feel free to do so in the comments. 1.Hua, Quan. "Radiocarbon: A Chronological Tool for the Recent Past." Quaternary Geochronology4.5(2009):378-390. Science Direct. Web. 22 Nov. 2009. Images that labelled for commercial purposes were only used. Other images without source are made by myself on whiteboard. Congratulations @aabhushan! You have received a personal award!